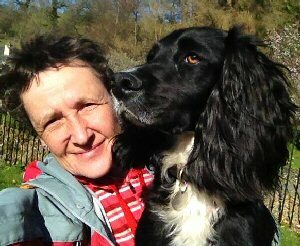 8th March was a big day for Catherine Wandzel and her agility girl Sky. They had qualified for the Medium Agility Team Final at Crufts. It was a dream come true! Last year she went as a spectator but this year she was in the ring with her team Dark Destroyer Dragonhearts. 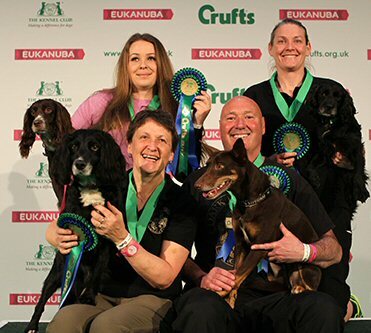 This is the story of their special journey to Crufts 2019. I got my first ever dog when I was 49. Sky was seven months. I’d pictured myself walking the Lake District Fells where I live, taking in the scenery with my faithful dog by my side. Wrong bong! 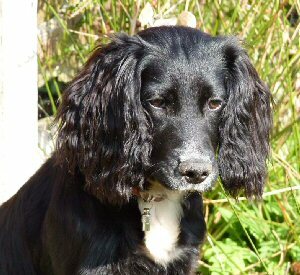 Sky is a Working Cocker Spaniel - challenging to say the least - so it was in a the deep end. At first, it was hard to cope and I came close to rehoming her. I soon learned I was going to have to exercise her mind as well as her body, so once Sky was old enough, we started agility classes with no real intention of competing. It was just something to do for fun. 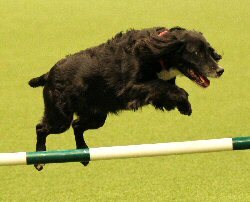 I’m not one for crowded places – but when my good agility buddy Jane suggested a St. Trinian's style outing to Crufts 2018 withs our agility friends, I jumped at the chance. We travelled by train from Cumbria to the NEC. Jo Public's dogs aren't allowed to go into Crufts so Sky stayed home. We entered the NEC through the main entrance and I was blown away by the sheer number of spectators, trade exhibitors, show-dogs and handlers, activities, demonstrations and competitions in all of these five great halls. There was no way we were going to see everything in one day! We immediately headed to the Arena in Hall 1 to watch the dog agility. We went down a long wide corridor with a pink carpet – the left side is for spectators going in and the right side is fir spectators coming out. The middle section reserved for those with special passes - specially people and dogs who were competing. We were herded down the left hand side of the carpet with all the other spectators. We took our seats and had a good clear view of the ring. We watched the handlers walk the course and then saw each of them run round with their dogs – all eyes and cameras upon them! The atmosphere was electric. We laughed, watched some more events and then headed to the other halls to watch other activities and shop for things we didn’t know we needed before heading home. Well, who’d have thought it! 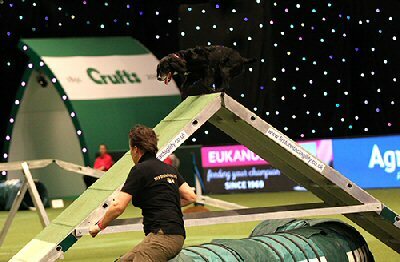 One short year later I’m back at Crufts – this time as a competitor. I’m in the Medium Team Final with my buddies Anastasia, Caroline and our trainer Nigel Staines with his team Dark Destroyer Dragonhearts. The difference between going to Crufts as a spectator and a competitor is that this time we have Sky with us. People stop to talk and ask about her and why are we here. We feel extra special and more connected with what’s going on. In the hotel the night before Crufts, so many thoughts are going on in my head - where exactly will we park? what time shall we leave the hotel? should I feed Sky in the morning or not? will I be able to sleep? will I be able to remain calm under the spotlights? What if I fall over? What if Sky poops in the ring? Don’t let the pressure of the competition become greater than the pleasure of the competition. This is your special day – be sure to enjoy it. It’s the morning of the competition. We arrive at the NEC. Richard is our Groom for the day and carries Sky's crate and all our kit. We enter in a special door, not the main entrance. We have our special pink pass and wrist bands to get us into the areas just for competitors and we arrive again at the pink carpet. This time we're going down the central aisle for competitors separate from the thousands of spectators. We're guided into a special curtained off area behind the Resorts World Arena in Hall 1 where there are 'benches' reserved for our dogs to chill in their crates. I meet up with my team and we're all excited and try to remain calm and focused. We study and discuss the course that we’ve just seen on paper – time for a quick warm up in the special competitors area. Now we walk the course. We watch the first team go out and get four clears - the pressure's on! We’re on second and walk into the arena. It’s warm and the lights are bright and the carpet feels strange under foot. We get in position. My team mates go out one after the other and get clear rounds – now it’s my turn with Sky. We're off – I don’t really notice the judge, the spectators or hear the commentator. It’s just me and Sky. I make a mistake early on and get 5 faults, but I carry on - still focused. I’m delighted with my run and Sky’s performance. She was ace and did everything I asked of her. We didn’t fall Sky, we flew! We now wait and watch the other seven teams perform – it’s more nerve-wracking than running the course! Results are in – we're placed 2nd. Wooooohsoooo! We're back out into the arena for presentations of medals and rosettes, then a quick lap of honour. We wave to our agility buddies who've come down to support us and are cheering and jumping up and down in the crowd. Finally we have the photo sessions on the podium. We can now relax and enjoy the rest of our very special day. It was awesome, a dream come true and we hope to be able to come back to compete again one day. Catherine Wandzel lives in Cumbria with her husband Richard and her Working Cockers Sky and Luna.